Since April 2016, microchipping your dog has been a legal requirement. Microchipping your pet vastly improves the chances of your pet being returned to you should they be lost or stolen. Find out more about the benefits and the procedure below. At Blythman & Partners your pet can be microchipped quickly by one of our experienced veterinary team, giving your pet the best chance of being identified and returned to you if they become lost or stolen. As of 6th April 2016, it is a legal requirement that all dogs are microchipped. 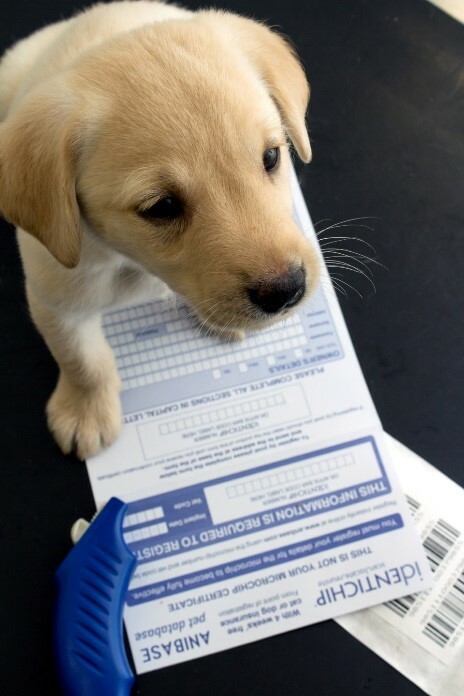 You may have already had your dog chipped in the past, but please remember it is also a legal requirement that your details are up to date. It is not just dogs and cats that can be microchipped but horses, and small animals such as rabbits and even tortoises! A microchip is a small, electronic chip enclosed in a glass cylinder that is about the same size as a grain of rice. The microchip itself does not have a battery. It is activated by a scanner that is passed over the area, and the radiowaves put out by the scanner activate the chip. The chip transmits the identification number to the scanner, which displays a number on the screen. This unique identification number can then be matched with your contact details, which are kept on a database such as Anibase or PetLog. It is injected under the skin using a hypodermic needle. It is no more painful than a typical injection, although the needle is slightly larger than those used for injection. No surgery or anaesthesia is required. A microchip can be implanted during a routine veterinary office visit. If your pet is already under anaesthesia for a procedure, such as neutering or spaying, the microchip can often be implanted while they’re still under anaesthesia. For more information or to book your pet in today please contact our Gosforth surgery on 0191 2841711.